Description from the book: "A little old lady's attempts to have pancakes for breakfast are hindered by a scarcity of supplies and participation of her pets." I first began using wordless picture books in order to elicit speech samples from kids who are of the shyer-type and don’t really want to be playing and chatting with some strange lady!! They work wonderfully for that purpose, but I’ve recently expanded my use of them to serve really everything else as well – Monitoring articulation progress at the structured-spontaneous level, forming grammatically correct sentences, sequencing… The possibilities are endless! Pancakes for Breakfast is one of my all-time favorite wordless picture books. You can usually find cheap copies on Amazon or in used book stores. The illustrations are engaging and adorable, and the storyline is wonderful, yet easy for students to predict/follow as they “read.” This book is great for eliciting speech samples, as well as targeting sequencing, expanding vocabulary, following directions, problem solving, and articulation. Okay, now back to Pancakes for Breakfast! Here are some tips for using this book to elicit a speech sample, target sequencing, and articulation. 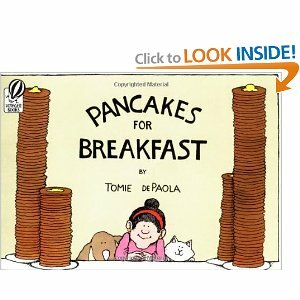 Speech sample: Introduce the book, “This book is called Pancakes for Breakfast. Look at the cover What characters do you see the cover? What do you think the story will be about?” Explain to the student that, “it is a special book. It doesn’t have any words, so your job is to be the author/storyteller and add the words to the story.” Instruct the student to, “Look at the pictures and use your imagination to tell the story.” If you feel like the student is leaving out key information or speeding through the book, try prompting or modeling strategies to elicit more of a storyline. To prompt more dialogue, ask open-ended questions (e.g., “Ooo – Tell me about what is happening over here?”). Use rich and descriptive sentences in your model, then give the child a chance to jump after he or she starts to get the hang of it. The “I’ll read one page, then you read the next!” line helps take the spotlight off the kiddo and makes him or her more comfortable. Fade out prompts and models as soon as possible to encourage more independent behavior. If the child really isn’t getting it, “read” the whole book to him or her first, then ask the student to retell the story. Articulation: The most common sounds in this book are typically /p/ (pancakes), /l/ (lady), “th” (then), and /w/ (wants). If the child’s target sound doesn’t appear naturally in the context of the story, or if you want even more practice with those that do, give the characters names according to the target sounds. E.g., Introduce the old lady before beginning the book, “This is Shirley. Shirley loves pancakes! Do you remember her name? That’s right, this is Shirley!” Encourage the student to use the characters’ names as he or she tells the story. Hope you enjoyed these ideas! Do you use wordless picture books in your sessions? How have you used them?